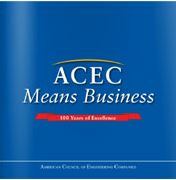 The American Council of Engineering Companies of Utah (ACEC Utah) is dedicated to the business and the advocacy interest of engineers in private practice. Participation in council activities is a benefit to all principals, associates, affiliates and staffs of engineering firms. ACEC membership is available to consulting engineering firms with offices in the state of Utah, who have leadership licensed professionally in accordance with Title 58 of the Utah Professional License Act. Associate membership is available to non-engineering companies or individuals that provide services that are complementary to the services of our member firms. ACEC is "on the point" for the entire engineering industry, promoting infrastructure investment and eliminating regulatory and tax barriers in the legislature, at the local level and in the courts. ACEC's Political Action Committee helps to elect House and Senate members who support ACEC's pro-engineering agenda. ACEC's Minuteman Fund is the industry's "war chest" for state legislative and legal battles of national importance. ACEC's prestigious Engineering Excellence Awards recognize the best engineering projects of the year. ACEC has traditionally provided its members with a wide array of first-class professional conferences and stand alone seminars.